In April 2018, more than 100 goats arrived on the University of Richmond campus, only a few miles from the heart of Richmond, Virginia’s capital city. The herd was the newest addition to the university’s landscaping crew, brought in to assist with the removal of invasive plant species. Though certainly still novel, “goat browsing”—an environmentally friendly landscape management practice that reduces the need for herbicide and gas-powered equipment—is becoming increasingly common. The goats achieved near-celebrity status during their six-week residence. Students, faculty, staff, and community members were enamored by the “new kids on campus,” and more than 100 media outlets, from the Miami Herald in Florida to The Bellingham Herald in Washington, covered their arrival. Ultimately, the herd’s fame played an important role in focusing awareness and excitement on a large, long-term, environmental restoration project on campus. In 2017, the University of Richmond created a strategic plan that provided direction and inspiration for achieving our mission: to prepare students to lead lives of purpose, thoughtful inquiry, and responsible leadership in a diverse world. The plan’s call to further weave environmental stewardship into the fabric of the university catalyzed conversations about developing an urban greenway along the Gambles Mill corridor, a half-mile paved pathway on the southern end of campus. Andrew McBride, associate vice president for facilities and university architect, walked the washed-out trail with a landscape architect from Waterstreet Studio, a local environmental design firm, to evaluate erosion and stormwater management issues. As they traveled the path, their conversation turned to the idea of also restoring Little Westham creek, which runs adjacent to the trail. They began to envision a more comprehensive restoration project, one that went beyond simply repairing the trail to become an all-encompassing rehabilitation of the land surrounding the greenway and the banks of the stream. McBride retained the services of the environmental mitigation company Resource Environmental Solutions, which determined that Little Westham creek was a strong candidate for stream restoration. Not only would restoring the stream decrease the amount of nutrients and sediment flowing to the James River, but it would also generate an ecological credit through mitigation banking that would offset the cost of the trail and habitat improvements. Now, the first campus stewardship project under the new strategic plan could begin in earnest. Stream restoration. Little Westham creek currently has deep, eroded banks and a straight, channelized route that impedes the breadth of its ecological function. The planned restoration will reconstruct the main stream channel to provide better flow, reduce nutrient load, and support biodiversity in and along the creek. These efforts will also benefit the health of the James River and Chesapeake Bay watersheds by improving downstream water quality and reducing the total maximum daily loads of pollutants entering these crucial bodies of water. Construction of a recreational trail. The upgraded Gambles Mill trail will be a multiuse recreational amenity connecting two major bike routes within the city and offering an ADA-accessible path to the James River. The walking and biking trail will be repaved and marked with signs to educate pedestrians about the native plants, local history, and the project itself. An “eco-corridor think tank” has engaged faculty in designing curricula that use the site as a living laboratory for learning. Also, large boulders excavated from another campus project will be installed as natural seating in an open-air classroom along the trail. Removal of invasive species. The area between the Gambles Mill trail and Little Westham creek had not been actively managed for many years and was overrun with invasive species. English ivy, Chinese privet, Japanese stiltgrass, and other plants inhospitable to local insects, birds, and bats that keep the ecosystem in balance had taken over. 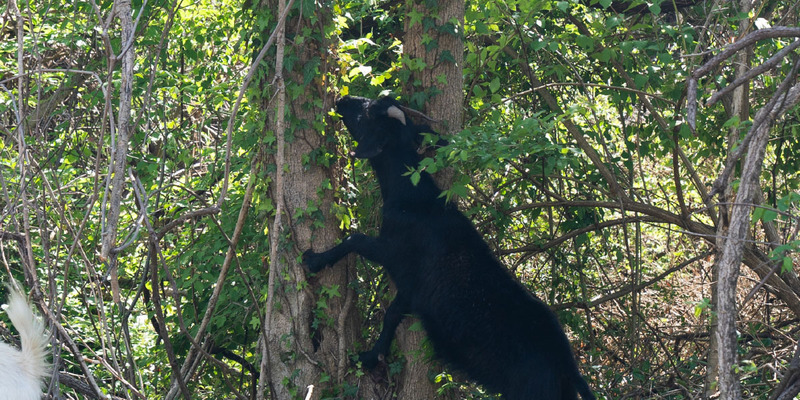 To the delight of the campus community, the goats kicked off the plant removal process, munching on anything they could get their jaws on, including poison ivy. While the animals thoroughly cleared the ground cover, they could not reach all of the tree-climbing vines. The remaining undesirable plants were treated mechanically with loppers and chainsaws, as well as chemically with spot treatments that met our integrated pest management standards. 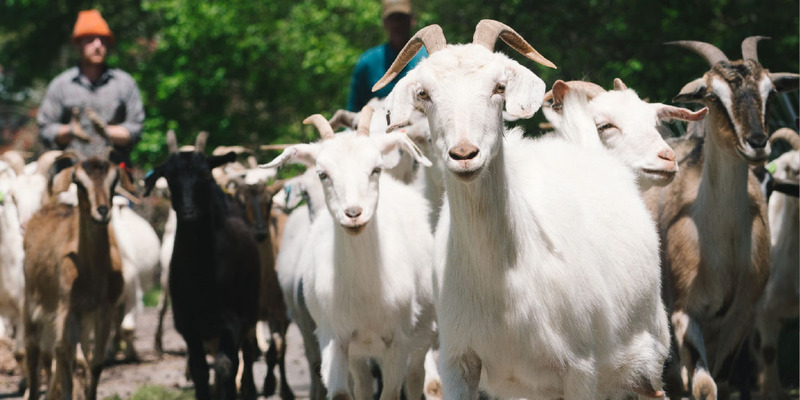 The University of Richmond, Richmond, Va., used more than 100 goats to assist with the removal of invasive plant species. It plans to plant more than 9,000 native trees and plants on its grounds to help revitalize a community eco-corridor. Though some trees and plants will be removed as part of the restoration’s expanded flood plain, more than 9,000 native trees and plants will be planted over the life of the project. As they mature, these plantings will help keep some invasive species at bay. In addition to retaining the community garden that has long existed within the eco-corridor, we plan to establish a pollinator meadow to support butterflies, birds, bats, and insects. The university’s beehives may also be moved to this meadow. Stormwater management. Before restoration work began, big rainstorms would send water rushing down the creek and straight into the river—carrying fertilizer, sediment, and other pollutants with it. The planned project incorporates best practices in stormwater management, such as step pools, into the eco-corridor to create a flood plain that better distributes water into and throughout the wetland. The ongoing successful revitalization of the Gambles Mill eco-corridor has not only emphasized the power of collaboration at the University of Richmond, it has also helped us to expand our vision of how to live our values. Today, we are facilitating a comprehensive stream restoration. As we move forward, we will take lessons learned upstream and look to restoring the entire campus watershed. SUBMITTED BY Rob Andrejewski, director of sustainability, University of Richmond, Richmond, Va.